We flash forward to a pledge mixer for Rush Week at Kappa House in January 2016. The entire atmosphere seems different. No more “Good evening, sluts” or degrading body critiques. Instead, Zayday and Grace warmly welcome the new pledge class with acceptance and kindness. Cathy Munsch has allowed KKT to have a Winter Rush, which is good, because Kappa is in serious need of members after the Devils cut down a few. Zayday introduces Kappa’s Treasurer, Hester, sans her neckbrace. 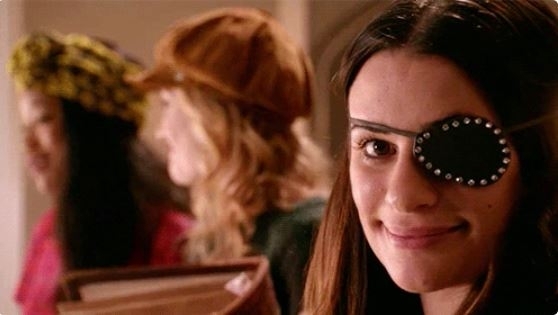 She now wears a black eyepatch over the eye injured by the stiletto heel. In voice over, Hester explains that she is the only Chanel left because she got away with it. Thanks to anatomy courses, she knew where to stab herself in such away as to push her eyeball to the side and cause no permanent damage. She seems pretty pleased with herself. Hester Ulrich is the Red Devil! We see the mental institution where Gigi raised Hester and Boone as Hester describes her nightmarish childhood. It’s 1995. The camera whirls in a circle, showing the growing babies and the ever miserable Gigi as the years fly by. It’s now Summer of 1998 and Gigi has mostly stopped wailing. Then five years later, she is teaching her two children about hammers and chainsaws using flash cards. During these weapon identification quizzes, Hester excels and Boone falls behind. Now an adult, Hester has to choose a persona to use while enrolling at Wallace University. While stalking the asylum common room, Hester spies a woman in an elaborate neckbrace and lunges for her. Alone, Hester holds the brace high as lightning and thunder clashes outside. Now free of the loony bin, Hester sits with Gigi in a café and tries to think of a nifty costume for the killers to wear. In storms the Wallace University mascot, the caped Red Devil. Inspiration strikes! Gigi murders the mascot and steals his costume. Not only is it stylish, it allows the killers to openly walk the campus in disguise. Boone, in the costume, breaks into Kappa with plain clothed Hester. They load Melanie Dorkus’s spray tan tank with acid. Hester explains to Boone that burning off their skin hits them in their vanity. We learn that Boone went undercover a year before Hester and never enrolled in school. He just showed up and rushed the Dickie Dollar Scholars without ever having to take any classes. Hester, who never went to high school, had to pass off forged records in front of the Dean. It doesn’t quite work. Cathy spots a fake, especially when discovering that Hester’s SAT score is 1 million percent. But the campus lacks diversity and no other student has a spinal injury, so miracle of miracles, Hester Ulrich becomes a student at Wallace University. In Kappa House, Hester meets Grace and Zayday for the very first time. 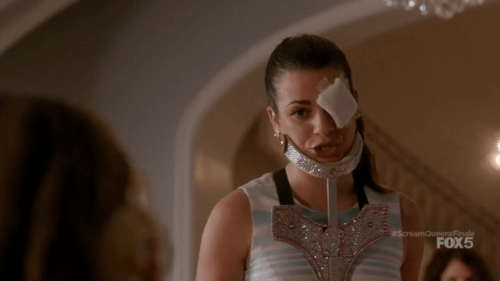 Zayday suggests bedazzling Hester’s brace to spice it up a bit. All this friendliness and being made the center of attention puts Hester on her guard. She wants to be as anonymous as possible. We flash a semester ahead to Hester with her eye patch standing in front of a new pledge class at the new Kappa Kappa Tau. She now knows that Weston Gardner is her father and Grace is her half-sister. She finally has a real family, though they can never know that she was one of the killers who purged the Chanels from the campus. She’s happy to be free of Boone and Gigi at last. It is now December 2015. After taking a heel to the eye, Hester is being carried out on a stretcher as Chanel Oberlin frets over her. We learn that Hester got an X-Ray of her own skull and calculated the length of the heel and angle of the insertion. Hester does her homework and then jabs herself with the heel, screaming. She wants to get away with murder AND pin it all on the Chanels. 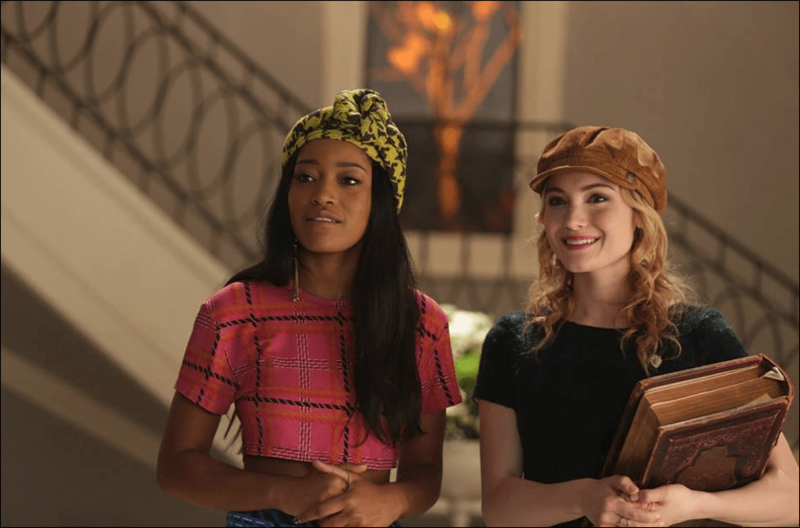 The Chanels, Grace and Zayday interrogate #5. She swears she didn’t do it, obvi. 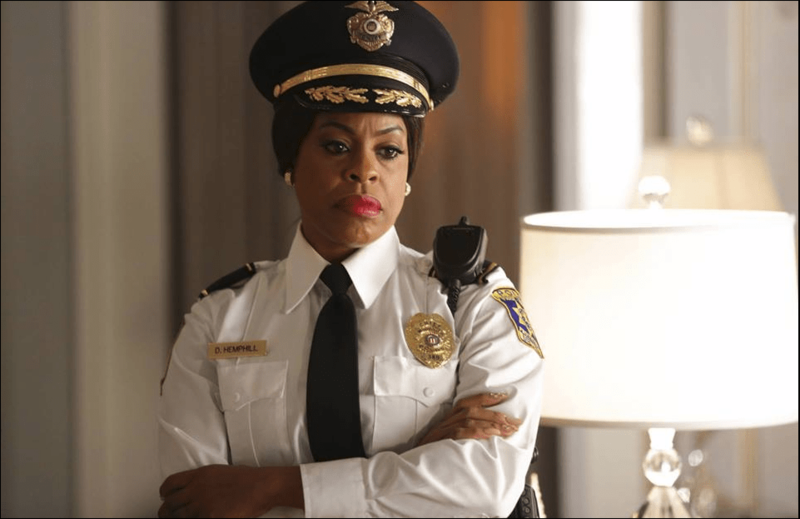 As they fruitlessly attempt to get to the bottom of the messy situation, in strolls Chief of Police Denise Hemphill. The cops have found the dead body of Boone, which Grace points out is not such a big deal. They’ve known he was dead for awhile. Zayday and Grace both adamantly believe that Hester is the killer, and both are stunned she enters the KKT house with a gauze pad over her eye. Hester explains that she was home-schooled and was embarrassed about it, so she created fake transcripts to cover it up. When Grace confronts her with the DNA test run by Pete, Hester says Pete was a murderer in cahoots with Chanel #5 and would say anything to throw off the scent. Next up, Grace raises the question of Hester’s parents. The doorbell rings. Hester’s parents Clark and Delight and their adorable dog burst in. There is much hugging. But something doesn’t seem right. Is it the robotic way Delight says, “Hester is definitely our daughter” or the movie star look of the couple? Delight explains that she and her husband worked deep undercover for the CIA, which resulted in no documentation about their existence. Zayday recognizes Clark from a prostate commercial. The doorbell rings again. This time it’s Mr. and Mrs. Putney. They look under-joyed to see their daughter Libby. She asks them to tell everyone that she’s not a serial killer or adopted. The Putneys explain that a woman named Gigi gave them Libby at a young age after she was released from a mental institution. All Gigi asked was that when the time came, they enroll her at Wallace and encourage her to pledge Kappa. They want nothing to do with her anymore now that she’s probably a murderer. Libby is screaming her head off in frustration. Hester meets with The Putneys and discusses the plan. They are extremely receptive to the idea of getting rid of Libby. Back in the present, Denise arrests Libby after her parents destroy her alibi. As Libby is about to be led away, Hester speaks up. It turns out that Chanel #3 is also one of the killers! 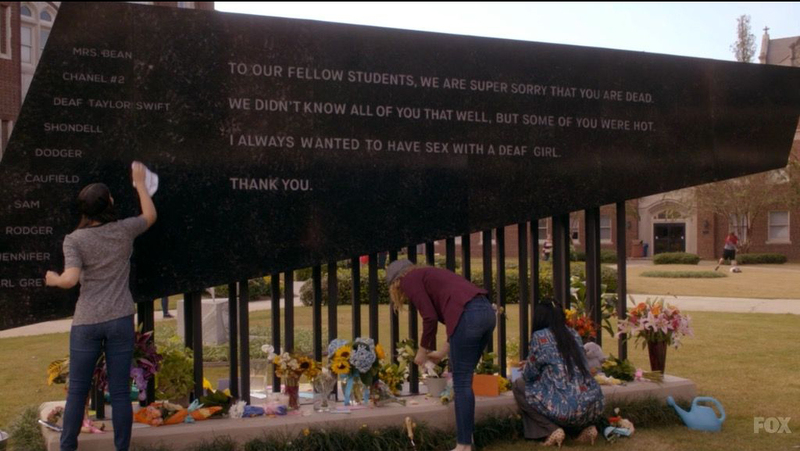 She killed Deaf Taylor Swift, according to Hester. On that night, #3 went to the White Stallion with #5 for banana daiquiris. She got a bad case of stomach cramps and sought out a bathroom. The Stallion restrooms were hideous, so she headed back to Kappa to destroy an upstairs bathroom. In flashback, we see Hester slip past #3 and shoot a dose of liquid laxatives into her cocktail as Predatory Lez prepares to dig the holes the girls will be buried up to their necks in, just before the Chanels leave for the White Stallion. Hester also pins Predatory Lez aka Sam’s murder on #3. When Hester went down into the basement to check on Sam, she found her dead and someone wearing earmuffs fleeing in the dark. Plus, Hester announces that #3 is Manson’s daughter and has a shoebox full of letters from him containing advice on the topic of killing your friends. Hester then produces a letter from a psychiatrist claiming to have treated Chanel #3’s split personality disorder over the course of 8 months. Her other personality is a biker gang leader named Dirty Helen. We see Libby in a stairwell with a leather clad #3, recruiting her to commit some murders. Chanel #3 is promptly arrested by Denise. And last but never least, there is the matter of one Chanel Oberlin. Hester points the accusing finger at her, as well. Turns out two months earlier Chanel purchased a variety of weapons at a home improvement store. All of them, a crossbow, a nail gun, two axes, etc., were used in the murders. Chanel denies this, so Hester pulls up security footage showing herself in a terrible blonde wig shopping away with a cart full of instruments of death. At the counter, Hester pays for the lot with a Diner’s Club card in Chanel’s name. She holds up the credit card statement. Zayday brings up poor Ms. Bean and the deep fryer incident. It doesn’t look good for Chanel. In the past, we see Hester turn the fryer on. Then #3 points out that Chanel attempted to murder Melanie earlier in the day. But it’s Hester who nails the coffin shut. Chanel suddenly flees as police officers dressed like male strippers burst in. Turns out they ARE strippers who joined the force under Denise. The muscle bound cops bust the three Chanels. As Denise leaves, she points at Zayday. It’s five months later and Dean Munsch walks through campus, jubilant and waving to students and colleagues. The blight of the Chanels is over and the horrific murders have ceased. The three monstrous former sorority sisters are denied bail and held for contempt of court. Chad Radwell and Denise form a serious relationship, and then break up when she joins the FBI. Awww. Chad hasn’t lost his classy romantic touch. Chad begins a charity called DDEGRDCCF, or Dickie Dollars Earl Grey Roger Dodger Caulfield Charity Foundation. Every dollar earned from keggers and wet t-shirt contests will go to charity. When asked what specific charity he means, Chad becomes slightly confused. Cathy wrote a bestselling novel called New New Feminism and becomes the toast of the town. Well, she had it ghost written, but it becomes a hit anyway. Hester, Zayday and Grace are cleaning the monument as Cathy approaches. Grace has to go, because she’s holding a “Get Your Yummies In And Your Feelings Out” party. Wow, I just realized this. Left unchecked by Chanel, Grace is pretty annoying. Hester talks up Cathy’s books and how the dead students were martyrs for a cause, but the Dean has a little surprise for her. Hester feels she shouldn’t be blamed for any of it. Her childhood was a nightmare and she only killed Pete, who was a killer himself. The Dean is planning to turn Hester in so that justice for the dead can be served. Hester leans in close. Grace shows Wes her new hotline center for pregnant students who don’t know what to do, dedicated to Sophia Doyle. Grace has become a human tidal wave of morality and kindness and has changed Wallace for the better. Wes is incredibly proud, and leaving for Napa Valley with Cathy for vacation. Back in court, the Chanels are up for sentencing. Though the verdict is Not Guilty, Chanel raises a ridiculous objection and throws a tantrum, so a juror crosses out Not Guilty and checks off Guilty on all 47 counts! The Oberlins have now disowned Chanel and stated that they believe she is indeed a serial killer. Chanel Oberlin, Sadie Swenson and Libby Putney are sentenced to life in an asylum. In the institution where Boone and Hester grew up, the Chanels find a wonderful, peaceful existence that is an eerie reflection of their sorority lives with all the narcissism and delusion it entailed. Except with medication and painting classes and no social pressures. The girls begin eating real food instead of cotton balls. Sadie goes “full Lez” with a nurse, Libby becomes tolerable via meds and Chanel rises through the nonexistent ranks. She is voted House President. Even her bed is placed on a higher platform than the rest of the ward. She pulls down her sleeping blindfold and gets under the covers in the show’s final moments. Tomorrow will be another day of art class, drugs and frolicking about. But there’s a creak of leather. Chanel pulls her blindfold up and surveys the room. She lays back as the Red Devil Killer brandishes a gleaming knife over her head. Chanel Oberlin, the Asylum Queen, screams! Tagged Chanel #3, Chanel Oberlin, Dean Munsch, Dickie Dollar Scholars, Gigi, Hester, Scream Queens, slasher TV series.